On December 31, 2012, Keating Law Offices' attorneys Michael Keating and Joseph Vietri filed a lawsuit against the driver of a Toyota SUV who is alleged to have struck a bicyclist at the intersection of Grand Avenue and Halsted Street in Chicago. The lawsuit was filed in the Circuit Court of Cook County, Illinois after the insurance provider for the driver denied the bicyclist's claim for damages. The bicyclist victim is seeking to recover for both the physical injuries he received in the collision and for the damage to his bike. The incident occurred on February 24, 2011 as the bicyclist was traveling westbound on Grand. The bicyclist had the right of way and was attempting to cross through the 6-way intersection of Grand/Halstead/Milwaukee. The defendant driver was traveling east on Grand and planning to make a left-hand turn onto northbound Halsted. According to the police report taken at the scene, the driver "admitted" to not seeing the bicyclist either approaching or in the intersection. The driver allegedly made a left turn directly in front of the bicyclist. The driver's abrupt "left hook" gave the bicyclist no time to react and he collided with the rear bumper of the SUV. The lawsuit further alleges that the driver's failure to yield to the bicyclist at the intersection caused the collision and resulting injuries to the bicyclist. Under Illinois law, the driver of any vehicle that is waiting to turn left at an intersection is required to yield to any vehicle approaching from the opposite direction if the approaching vehicle makes completing the left turn hazardous. (625 ILCS 5/11-902). As we have previously covered in the Illinois Bicycle Law blog, Chicago has enacted laws that provide additional protections to bicyclists by specifically stating that a car driver waiting to make a left turn at an intersection must yield to any approaching bicyclists. (Chicago Municipal Code Section 9-16-020(e)). Here, the lawsuit alleges that by failing to yield to the approaching bicyclist, the driver of the SUV violated both Chicago and Illinois state laws and is liable for the damages incurred by the bicyclist. The Illinois Bicycle Lawyers at Keating Law Offices have previously won favorable settlements for bicyclists injured by drivers who have failed to yield as required by law. Our firm's experienced attorneys are passionate about protecting the rights of all bicyclists. Were are here to help if you have been injured while biking due to a reckless or careless driver. If you have any questions regarding this post or an issue involving Illinois personal injury law, please contact Illinois Bicycle Attorney Mike Keating by calling 312-208-7702 or emailing him at MKeating@KeatingLegal.com, 24 hours a day, 7 days a week. All emails and phone calls are returned promptly. All initial consultations are confidential and free. KEATING LAW OFFICES is the top law firm in Chicago, Illinois representing victims of bicycles accidents and crashes. The firm has successfully represented hundreds of victims of bicycle accidents and collisions in Chicago, the suburbs, and throughout the rest of Illinois. In the process the firm has recovered millions of dollars in compensation for its clients. The firm offers free legal consultations and there are never any fees unless we win your case. The firm is managed by Mike Keating, an Illinois bicycle accident attorney based in Chicago and founder of KEATING LAW OFFICES. The firm has handled several high profile bicycle-related cases and is known as a firm that is not afraid of handling complicated bicycle-related lawsuits and claims. The attorneys at Keating Law Offices are considered national leaders in the area of bicycle law. Mike Keating is himself an avid bicyclist and is the Chair of the Bicycle Litigation Committee for the American Association for Justice. He is also on the Board of Managers for the Illinois Trial Lawyers Association. The firm's attorneys are always available to answer any questions regarding a bicycle accident or crash. The firm's attorneys can meet you any place that is convenient for you to discuss your case. Please call at any time for a free consultation with absolutely no obligation. We are here to help. Info on how to get the Bike Flag for FREE. 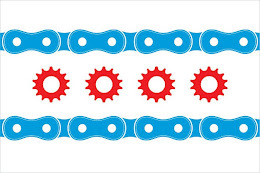 The Chicago Bike Flag is TM and (c) of Keating Law Offices, P.C. Keating Law Offices is a Chicago, Illinois firm of trial attorneys focused on handling cases involving bicycle collisions and accidents. Keating Law Offices has successfully represented hundreds of bicyclists throughout Illinois who have been injured in a bicycle crash or accident. If you have been injured in a bicycle crash or accident, please contact Illinois Bike Accident Attorney Mike Keating at mkeating@keatinglegal.com or call Keating Law Offices at 312-208-7702. All initial consultations are free and all communications are confidential and privileged in accordance with Illinois law. Keating Law Offices represents victims of bicycle crashes and accidents throughout Illinois including Chicago, the surrounding suburbs, and Downstate Illinois. Bike Collision and Accident Attorney Mike Keating and the attorneys at Keating Law Offices have represented clients in the Circuit Courts of Cook County, Lake County, DuPage County, McHenry County, Kane County, Will County and LaSalle County. The clients have been from the Chicago neighborhoods of Pilsen, Austin, Andersonville, Bucktown, Wicker Park, Loop, West Loop, South Loop, Bridgeport, Lakeview, Lincoln Park, Morgan Park, Englewood, Edgewater, Ravenswood, Rogers Park, Sauganash and Beverly as well as nearby suburbs such as Oak Park, Evanston, Elmhurst, Villa Park, Evergreen Park, Highland Park, Kenilworth, Glen Ellyn, Glenview, Wheaton, Lisle, Naperville, Orland Park, Glenview, Winnetka, Wilmette, Arlington Heights, Northbrook, Round Lake and Skokie. 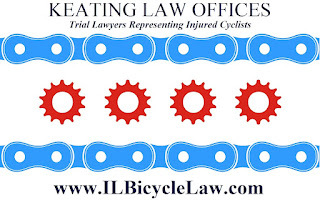 Chicago Bicycle Crash and Accident Attorney and Illinois Bicycle Crash and Accident Attorneys at Keating Law Offices, P.C. Disclaimer for the Illinois Bike Accident Attorneys at www.illinoisbicyclelaw.com: The legal information regarding a bicycle accident, any potential claim, or other legal information or commentary detailed on this site should not be construed or considered to be formal legal advice. The legal information and commentary on this site also does not create the formation of an attorney-client relationship or any professional responsibility. Please contact a Chicago bike accident or Illinois bike accident lawyer at Keating Law Offices. This web site is not intended to provide legal advertising or to solicit clients for matters outside of the State of Illinois, although the law firm of Keating Law Offices has relationships with experienced attorneys throughout the United States. 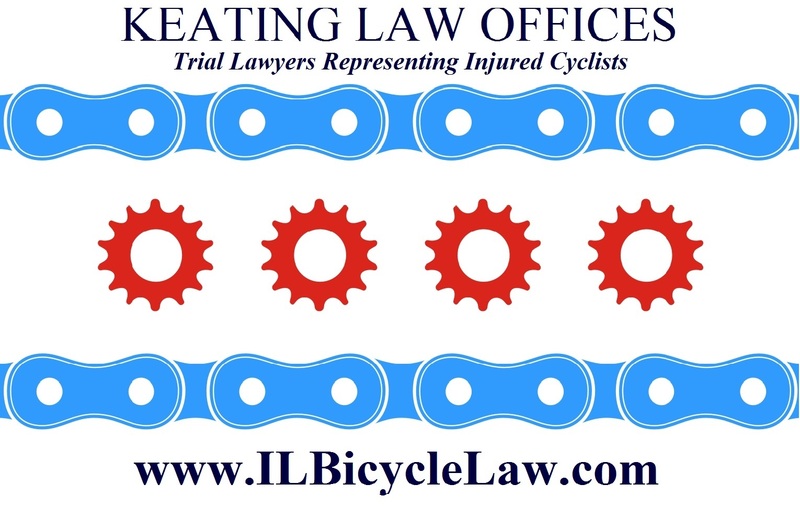 The Chicago Bike Flag and www.ILBicycleLaw.com are protected Copyrights and Trademarks of Keating Law Offices, P.C. in Chicago, Illinois. Unauthorized reproduction is a violation of federal copyright and trademark laws. All content, images, and logos are Trademarks (TM) and Copyrights (C) of Keating Law Offices, P.C.. Powered by Blogger. The Illinois Bicycle Lawyers are one of the nation's leading law firms that focus on representing injured bicyclists.